I should firstly introduce myself. I am the individual referred to on this site as Yak - a pseudonym chosen a long time ago, back in the days when hi-score tables on coin-op machines only held three letters, and I settled on Yak because the yak is a scruffy hairy beast - a lot like me ;-). I also have something of the ox nature - I may not be the sharpest knife in the drawer but I am patient and stubborn and I will plod along until I get where I want to go no matter how long it takes. I first started writing games on an old Commodore PET at the end of the 1970s, and in 1982 I founded Llamasoft, developing games for the Commodore Vic-20 and 64. 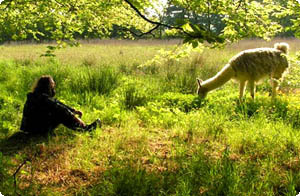 Llamasoft flourished for a while, mainly in Europe, and became known for its distinctive style - the games usually contained a degree of humour, references to various ungulates, and satisfying gameplay. Satisfying to some people, anyway - Llamasoft games weren't to everyone's tastes, but those who did enjoy them were loyal, and that era of Llamasoft is fondly remembered by many. As the videogame market evolved, self-publishing became unfeasible for a small company like Llamasoft, and I began to look at other ways of getting my stuff published. I was instrumental in helping to break the concept of shareware into the UK with my Atari ST, Amiga and PC game Llamatron. I also did some contract work for Atari; perhaps my best-known creation for them being Tempest 2000 for the Atari Jaguar. More recently I've worked for a company called VM Labs, and I produced Tempest 3000 whilst employed by them. But that was a huge project... taking me over two years from start to finish. When VML filed for Chapter 11 and I found myself out of a job, Gnu-Llamasoft was born, initially creating small but fun games for the PocketPC and PC. The most successful of which was Gridrunner++, which has now been ported to Mac OS X too. My most recent games work sadly did not see publication - "Unity" was an ambitious project undertaken in partnership with Lionhead Studios. That was extremely rewarding to work on, but in the end we decided that we couldn't really do it justice within the timescale that we had, and development of Unity ceased. Disappointing though it was to have to have to put Unity on hold, nonetheless the time spent creating it was extremely valuable for both the experience of making it and the fact that it brought together a group of friends into something more than that, into a Crew of talented and creative individuals with a common vision - and in the end, maybe *that* is the true Unity. Through Crew contacts I came to the attention of Microsoft, where some people were already aware of my lightsynth work and who took a chance and threw an Xbox360 devkit at me and said "ok then, show us what you've got". We believe that the results speak for themselves. All of the Crew are happy and proud to have been involved in the deveopment of something that is truly a thing of beauty. I live in beautiful surrondings in rural west Wales with my partner Giles and four sheep, two goats, two llamas and a small mad Border Collie named after a curry. Working with Giles is pretty much the first time I have shared the burden of development with anyone and again I feel that the results speak for themselves. Giles' excellent coding abilities and expertise in all kinds of highly relevant areas, and his highly mathematically informed creative vision broaden greatly the strength and scope of Llamasoft's development abilities, and together we are ideally placed to drive forward the development of our Neon technology in many interesting ways in the years to come. The Xbox360 interactive visualiser is just the beginning, the first step into a future filled with beauty, light, creativity and fun.